To make things simple: if you want to use any of my images anywhere, I ask that you contact me for permission. For now, I am making an exception for use on Pinterest, as long as you pin the images directly from this site. Please do not pin them from a search engine results page, and do not save them to your own computer and then upload them to Pinterest. 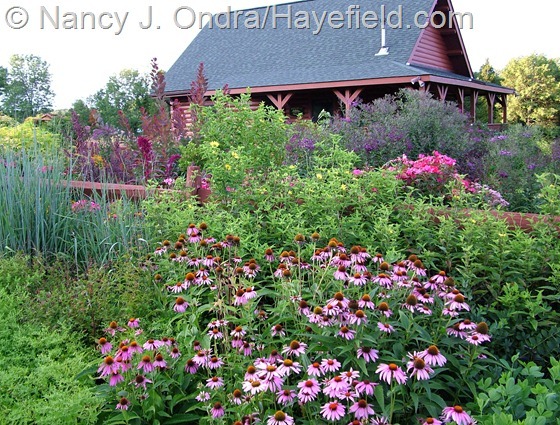 Unfortunately, quite a few of my favorite photos have been lifted from my old Gardening Gone Wild posts, particularly those from the days before I was consistently adding watermarks, and I have been recently working on tracking them down. Please do not take offense if I leave a comment on one of your pins asserting my copyright to a particular image, or if you get a notice from Pinterest, Tumblr, WeHeartIt, or Facebook that the image has been removed from your account. I’m only doing that when the original source did not link either here or to GGW (and yes, when I can find them, I’m asking the original source to remove the image from their site). I’m not saying that you intentionally did anything wrong, and on Pinterest, I make a point of asking that they do not put a strike against your account. I am including several of the images in question in this post, so if you like them, you can pin them directly from here instead of repinning them from other users who may or may not have used them fairly. If you wish to use one of my images anywhere else, please contact me through nan@hayefield.com to ask. In most cases, I’m happy to give the ok to link directly to a photo here if you are writing about something to do with Hayefield or one of my books. I sometimes give permission for free use for educational purposes, such as scientific publications, if I am not under contractual restrictions from previous sales of the image. If you want to use any of my images elsewhere (in a web-based article, in a print publication, in a lecture, for an eBay listing, or on a commercial website, for example), I am more than willing to negotiate a fair price for use in those circumstances. Unfortunately, I can’t accept just a link or a credit line; as I’m sure you can understand, you can’t buy alpaca treats with links or credit lines. It should go without saying, but apparently it needs to be said: Do not take any of my images (or anyone else’s!) and remove or obscure the watermark. If you do that, it’s a major issue of copyright infringement, and you’re setting yourself up for serious fines, as explained in this article: Watermarks Can Be Music to Your Ears. Thanks to all of you for taking the time to read this, and a big virtual bouquet to you, Susan, for first notifying me about the misuse of my images on Facebook and Tumblr. I have learned a lot about reporting copyright infringement notifications this week, so if any of you find yourself in a similar situation, please feel free to get in touch and I’ll be glad to share the links with you and help if I can. By the way, did you know that it’s pretty easy to find out if other people have used one of your pictures on Pinterest or another site, thanks to Google Images? Try typing your name, the name of your blog, and/or the name of a particular post into the search bar to find the images that you have uploaded. Then, click on any image, drag it up to the search bar, and drop it there to do a “search by image.” The results page will show you links to pages with matching images, as well as a collection of similar images, which is worth checking out because you may find cropped versions of your image there. 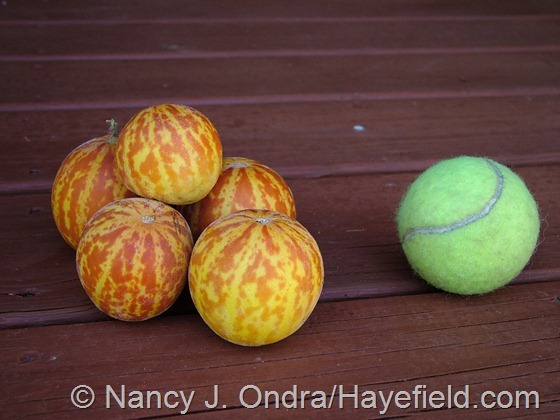 It amazes me how many times people have taken the above image and cropped out my watermark and the tennis ball, then used the image to sell seeds of plum granny (a.k.a. 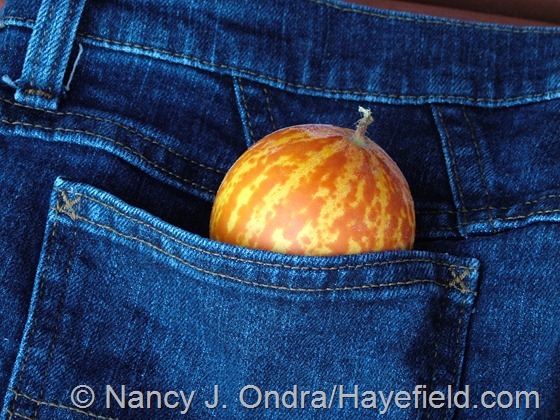 Queen Anne’s pocket melon). It’s not even a great photo. Don’t ask me why, if they are selling the seeds, they can’t take pictures of their own plants, but there you are. For more information on the various ways to find out where your pictures have appeared, check out Google Search by Image. Well, that’s more than enough negativity for any day. Now, let’s enjoy the delights of spring (or fall, depending on where you live) – and don’t forget to take lots of pictures! Thanks so much, Brenda. Blogging certainly has changed the way I look at the garden, and the projects I undertake. I garden to please myself, as we all should, but knowing that there will be an audience here encourages me to experiment more than I used to. Have a great gardening season! All well said and I fully agree with you. I am so happy to read your posts and to enjoy your great photos that you can indeed be proud of. I find it absolutely wonderful that you write for us every month and this just for free! Last month I ordered all your books except the one I already had ;-). The last two arrived the day before yesterday and I have not look into them yet as I want a LOT of time to dive into them. Thanks for all your efforts! My goodness, Helene, I’m so pleased that you went to the effort of getting all of the books. I hope you find that they were worth it. I know you’ll enjoy Rob Cardillo’s gorgeous photos. My best to you and your pups. Great post, Nan. All bloggers should know about this. I really enjoyed seeing the “hot” images of your garden, too – those that were most popular and attractive to innocent or not so innocent people using your images. The melon one is funny and also useful for me, as I have seed for that funny little fruit, but didn’t want to plant it – until now! Nice try, Clark, but I find it hard to believe that there’s ANY seed you didn’t want to plant. 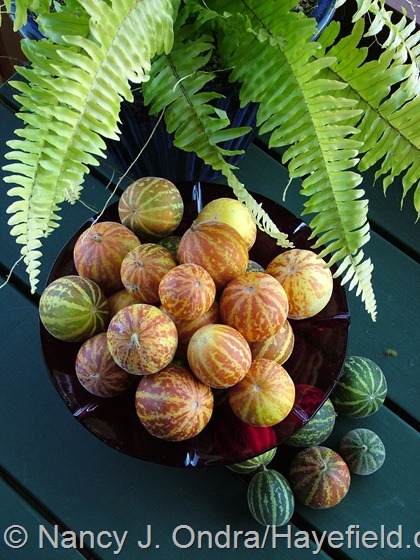 I think you’ll enjoy the pocket melons: the fruits are so pretty to display in a bowl inside, and the scent is rather nice too. Nan, I didn’t find this to be a negative post at all, but quite enlightening and educational. I support you 100% in protecting your copyright and images. Thank you for sharing this information. I look forward to your bloom day post. Thanks for that, Carol. I realize that some people find all this concern about owning photos to be ridiculous; their stance seems to be that if we don’t want our images taken, then we shouldn’t put them up. On the other hand, anyone who takes the time to read a post like this likely isn’t one of those people: they realize that taking good images and trying to find creative ways to present them requires a significant amount of time and and thought. As someone who has invested an immense amount of time and love into her blog, and who has given so much back to the garden-blogging community with the joy of Bloom Day and other fun initiatives, you are a star in our world, and I appreciate your support. I never tried eating the pocket melons, but I did try ‘Tigger’, which looks very similar, and I’d say that “dirt” would be a compliment in comparison. Even the boys wouldn’t eat them, which is really saying something. Nan, I am glad you found your lovely photos and are having Pinterest deal with the problem. I found at least one of my photos the same way. A friend innocently pinned it from this woman’s blog. It wasn’t even one of my better photos, but I recognized my arbor. I wrote the woman, and she was quite upset with me. She said it wasn’t a big deal. Sheesh. I have pinned your photos, but I always put your name in the comments and linked here. You put it all so kindly. Sorry you had to deal with that, Dee. I’ve had some people with a similar attitude. but only one has been distinctly difficult about removing an image from their site, thank goodness. All of the big sites have responded to takedown requests within 12 hours or less, which tells me that they take the matter very seriously. I think more people are beginning to understand why this is a problem. The wild and wooly of the Internets reminds me of the Wild, Wild West. Have a beautiful day! I can understand why some don’t consider it an issue, but it seems to me that it’s as valid a choice to protect one’s work as it is to share it freely. Keeping up with the various ways to share and protect is an ongoing challenge for all of us, whether we’re writing or reading! You are amazing. Even when you post on a subject like ‘copyright issues’ you write clearly, informatively and elegantly with images that move us. Your posts are simply the best. We appreciate your sincere dedication and many talents. Thank you for that, John. I hope you were able to get to the Flower Show this week. This is definitely no weather for being out in the garden. I really hadn’t wanted to do a whole post about this, Susie, because I too thought it was pretty clear that I wanted people to ask first, but then that didn’t directly address Pinterest. Plus, I was hoping to help other bloggers with some of the resources I’ve found this week. Thanks for reading! This is a perfectly reasonable approach, which will also allow people who are interested in your garden to actually find you. Your garden, photos and words have always been inspiring to me. Thank you, Robin. I’ve recognized some pictures of your own garden as I’ve been looking through Pinterest, and you have a well-curated page. You’ve made much better use of the platform than I have, that’s for sure, but I may put some more time into it now that I’ve finally joined. Nan- there are many “blogs” that have taken my posts and photos. When I click on those blogs, they somehow have coding behind the scenes that clicks every ad on their page. I made the mistake of leaving a comment on one of those blogs and I think that fired up their automatic click weapon. Sigh. I know you’ve been fighting the scrapers for a long time, Freda. It’s such an unfair return for your dedication to putting out quality content and images. Thank goodness for all of the nice people to counteract the few bad apples. I did get a message from Pinterest yesterday about the removal of a pin (the top image) and they were very clear that the copyright dispute was between you and a specific user. Neither the e-mail I received or this post rings negative to me at all. Protecting copyrights on images must be a daunting task in the on-line world. When on Pinterest I always try to pin from the actual source but sometimes that is impossible to determine. A few years ago I attended a garden symposium and was taken by surprise when one of the presentations included pictures from my garden and from my friend’s garden (who was also attending the symposium). Both of us are home gardeners and were somewhat flattered that someone considered them worthy enough to use in a presentation. At the time we were posting alot of garden pictures on Gardenweb which is where the speaker had found them. Apparently he had never encountered the owners of the gardens he was showcasing in his audience before and was a bit flustered. At least he wasn’t using them as examples of bad design :). How embarrassing *that* would have been for all concerned, Sue! The speaker certainly should have been flustered, since he used your photos without even asking you for permission, let alone offering to compensate you. It doesn’t matter if you are a home gardener or a professional photographer; the images are still your property. I’m sure HE was getting paid for his talk, or at least getting publicity for his business. Thanks for letting me know about the message you got from Pinterest. I wasn’t sure if they actually notified people or if they just deleted the image. Well said, Nan. I’ve been so inspired by your photos for a few years now. I recommend your books to any of my gardener friends who are struggling with combination inspiration. You have a unique style to your photographs and I can normally spot one of yours easily. I’ll go through my Pinterest page and make sure any I have of yours are linked properly. Thank you for this reminder!! I appreciate your comment, Julie. Though I’m pretty new to the Pinterest thing, I can completely understand how easy it could be to get in a pinning frenzy and forget to pin from an original source. I added my picture of the bunny with the Allium schubertii above if you’d like to pin it from here – thanks! done! thanks, even though I’d picked it from GGW I now noticed it lacked the water-mark. Great! It’s amazing how quickly things change in the online world. Five and six years ago, watermarking was hardly an issue – and there were a lot fewer readers too. This has been a great excuse to look up and reuse some of my favorite pictures. I have been pinning your photos, but I think all are directly from this blog. And I love all these photos on this post, so I’d like to pin them as well! Thank you! Thank *you*, Molly; pin away! While alerting us to the proper respect and legality in using your photos, I find you as gentle, generous and informative as with all of your sharings. Again, thanks for all you offer out and inspire us with. Readers like you make this all worthwhile, Joanie. I’d much rather write about happy things, but it seemed important to address the issue. Now, I can concentrate on wishing the snow away so I’ll have something to photograph for Bloom Day. Thank you for allowing us to post to Pinterest. There are several bloggers that have blocked that (as is their right). My dear husband is my chief photographer, and he watermarks. It is a shame that some people are cutting off the watermarks and reusing the photos – what do they think the watermarks are there for? I worry that someday we will be forced to put our watermarks diagonally across the photo, like sites that sell the images do. Oh, well…thanks for an excellent post and your beautiful photos. Bless you and yours. Ugh, I’d really hate to do watermarks like that, Shenandoah; if things got that bad, I think I’d give up on blogging altogether. It’s one thing for someone to take an image because they just didn’t know any better but another when they deliberately obscure your watermark. I found a well-known wholesale nursery in the Pacific Northwest had done just that with several of my photos. You’d think that a business would know better than to be intentionally deceitful. Takes all the fun out of blogging (but only for a bit, thankfully). I can only hope that my garden is beautiful enough someday so that I have to send out notices to people to stop using my photos of it! I think you are being overly modest, Susan. And, it can be an issue even for people who post only plant closeups, because those are the kind of shots that nurseries and eBay sellers like to take for their own sites, though they are much harder for anyone other than the photographer to recognize. I really appreciate you getting in touch! Hi Nan, I was one of the Pinners who had inadvertently pinned your lovely picture of the garden arch. I received a very polite letter from Pinterest telling me that it had been removed due to a complaint from the picture’s owner and that I was not to blame for it’s presence on Pinterest. I wrote them back to tell them that I had received a comment from you & that I deleted the picture & joined your blog. I look at this as a positive situation. If this hadn’t happened I might have never found your blog & would have only one amazing picture. Now, I have your blog to enjoy!!! Thanks so much & I completely understand your position. Hi Becca! I am so glad to hear from you. I went to respond to you on Pinterest and then couldn’t find the photo, and I was concerned that you were one of the people who might have gotten their feelings hurt. It’s super to have you as a new reader. Have a wonderful spring! Your photos are beautiful! Thanks for allowing us to pin them responsibly to Pinterest for inspiration. Wow, I learned a lot Nan, thanks. I would also say to be careful following links where your photos are. I did that on some of mine and yikes! btw, it’s obvious why your photos are pinned so much – they transport you! That’s an excellent point, Jean! I too have learned to be cautious about that. So far, I’ve accepted that trying to pursue takedowns on foreign sites is basically useless; maybe that will change in the future. For now, I’d much rather think about seeds and flowers. I wish you a wonderful spring! Nan, I can’t even TELL you how often I go through this! People who don’t do art for a living don’t truly understand how the artist makes money! You say it so truthfully though… can’t buy alpaca treats with a URL! I can only imagine, Donna. I read a lot of fanfiction and see images being reblogged on Tumblr thousands of times without even a credit to the original artist. I have also seen occasions where people have taken others’ stories and simply changed the characters names – assuming, I guess, that potential readers follow only one fandom. They usually disappear after a thorough trouncing from eagle-eyed readers – but then, they probably just do it again under another screen name. I do believe that the copyright issue is just as relevant to artwork as it is to photography, but then, I’m not a lawyer. You could try wading through the original text of the Digital Millenium Copyright Act (DMCA), or start with a summary, such as this one: DMCA Takedown 101. It takes a lot of time to pursue these infringements – time which you could be using to draw a new piece of art, play with your dog, or nurture your garden – so only you can decide whether you want to take that route. Thank you for bringing attention to this problem in such a kind way. I hope many more people realize the legal issues involved and use images they find on internet in an ethical way. Thanks, Kathy. With the prevalence of camera phones and inexpensive digital cameras these days, it’s so easy for people to take their own pictures these days. Or, they could get them through Creative Commons, where people who want to share their work make it available for use without a fee. But then, it’s simply so easy to do a Google image search and find thousands of pretty pictures to choose from. I believe the vast majority of people who misuse photos don’t intend to infringe anyone’s copyright; they just don’t realize that images they find aren’t simply free for the taking. Nan, thanks so much for allowing us to pin your photos on Pinterest. I have a board there called Plant Combos, and I have several of your pictures of combos pinned there, often also with whatever words you’ve used on your blog to describe them. I hope that’s ok. Your plant combos are so inspirational. I bought your book about Grasses because of your blog. That’s great, Alison – thanks for buying Grasses! As I haven’t actually done any pinning (yet), I don’t know exactly how people pick up the text they use to accompany the pictures, but it looks like Pinterest must sometimes automatically suggest the image alt text (the photo info that appears when you put your cursor over each image). That’s fine with me, because I put extra time into my posts to make sure each photo has the plant ID info in the alt text, and I think it makes the images much more useful. And now that I’ve learned to use “at Hayefield.com” at the end of each alt-tag line, that provides an extra link to my site, which is a good thing. But if people want to add their own notes as well, to remind themselves or let others know why they made the pin, that’s certainly fine! I guess on some level I knew people were out there lifting photos, but I never imagined it was so widespread! Thanks for bringing up the topic and running through all the fine points. As always I’ve learned something new from you! You wouldn’t have much reason to think about it, Frank, unless you saw how first-hand quickly an image can be dispersed on a site like Pinterest or Tumblr, or if you were lucky enough to have someone let you know that they saw your images used without credit. Once you start looking for your own photos, you might be surprised to see where they turn up. On the other hand, maybe you don’t want to know: there are much more positive ways to use your time and energy, like planting and weeding! Anyway, I can totally understand where you are coming from with this post. You are absolutely right, Christin. It’s good that they took the photo down but a shame that they used it in the first place. I use Windows Live Writer for composing my posts, and it automatically adds the watermark for me; sometimes I just have to shift it around so it’s visible. If you can add your initials, you can add your whole name or whatever other identifying info you want to mark your images. I’ve had a related experience….my personal garden was on a Garden Conservancy tour and I subsequently found that -without permission – a visitor has posted a series images taken in my garden that are now on his personal .com website which in turn links to a Flickr.com photostream. Not sure how I feel or if the photographer might in any way be profiting from his photos of my garden. It’s a odd new world…..
I’ve also had a number of situations where other photographers have published photos of my combinations that are…well, let’s just say that I’d rather *not* have been credited with them. In another case, another writer used another photographer’s picture of my meadow in his book as an example of poor meadow management (because I choose to allow some of the cedars to grow); not a great feeling. Thanks for the important information you have here. I didn’t know the trick about dragging an image to the Google images search bar, then searching for the copies. I thinks it is important for others to know that you write and publish books and it’s how you make an income. Very few of us have the garden or the high quality of photos that you have here on your blog and I totally agree with your post and the warnings. Sadly, there are a small minority that run rough shod over the ideals of personal rights and think that since it’s on the internet it’s free for the taking. My kids stick to .org and .gov’s and try as best they can at school to honor the hard work of other photographers. Absolutely, David, gardeners are a great group, on the whole, and sharing is an integral part of what gardening is all about. It is fantastic that you make the effort to educate young people about issues like photo use. Things are changing so quickly that most of us have to learn the hard way about online etiquette – like not typing in all caps, or being careful not to hit “Reply All” to emails (ugh). As a former musician, composer, and recording artist I found this post and the comments to be very informative and enlightening. Unfortunately, copyright infringement is rampant on the internet. Now I’m working as co-owner of an organic perennial nursery, destination garden center and botanical garden who is also a photographer and author of a gardening book. I did some of your suggestions (as a lark) and found, yes indeed, my copyrighted photos were being used all over the place. In particularly, I found a commercial website selling seeds that was using my photo of Allium Purple Sensation. The website did not have a phone or email information so I took to social media. I posted a message on social media page informing the public of their copyright infringement. In a matter of an hour my photo and a few others (not mine) were removed from their site. We are now in the process of adding an html code that overlays a transparent image on top of the photo on our whole website. Very simple code. So if they save the photo it is a blank photo. If you would like this info, I can send it to you. I am very skeptical that watermarking really deters the hard-nosed thieves. Once they have removed your watermark and placed it online to copy on and on (without the watermark), how does one track the true ownership once that watermark has been removed? Thank you for addressing the copyright ownership issue. It is a complex one and not easily solved. Very time consuming – almost like a virus in overdrive. Glad spring is on its way. Got thousands of plants to pot….that should keep me and my greenhouse assistant going for awhile. Holy cow, Lorraine – what a story! You picked a smart way to handle it. When you can’t figure out how to contact a site’s owner at all, you can pursue the next level up: contacting their ISP. There’s a good explanation of how to do that in this article: Two easy steps for using a DMCA takedown notice to battle copyright infringement. I’m intrigued by your idea of adding the transparent cover to your images. Would that still let people pin them to Pinterest, though? It’s my understanding that you are not required to have a visible watermark on your images: When you create them, you immediately own the copyright. There is a way to use the metadata attached to the image as another way to stake your claim, and there are various other routes for digital or invisible watermarking. I can’t even begin to explain them myself, but they’re touched on in the overview article Copyright at Photoshop Tutorials Plus, and metadata is explained in more detail at What is metadata: copyright photos in 4 steps. Have fun potting, you lucky girl. Wow, great post. I too am one who can’t believe I can read your ruminations and peruse your photos. For Free! That is so amazing. I am not worthy. I also believe in giving credit where credit is due. Well, the down side of reading my “free” stuff is that it has not been polished by another editor. Here, I don’t write as carefully or as tightly as I should because I’m not limited by a word count. And if I feel like using lots of exclamation points, I do, even though I know that some people find it *really* annoying. I also write about topics that no normal book publisher or magazine would pay me for. It’s a lot of fun for me, and if you enjoy it too, then it’s a win-win situation! Thanks for all the information. Adding the transparent image overlay does not allow anyone to copy or use the “save as”. They would only be saving a transparent gif. Unfortunately, I have seen people repin without adding the link to where the picture is copyrighted or taken from. Then the repinning happens and there is no credit to where the photo originated. It’s a big mucky mess. I appreciate the extra info, Lorraine. I guess if people really wanted an image, they could take a screenshot and steal it that way. As one article said, the only sure way to prevent the problem is to never post any pictures – a very sad thought. I echo all of the other wonderful comments about the value of your post. I share many of the same frustrations (and horror stories) as those who have had their work co-opted and used without permission. And you are absolutely correct, you own your photos, watermarked or not. I got that legal opinion the hard way — I paid for it. We had to retain an attorney when an unethical breeder used photos of our dogs (lifted from the garden blog, mind you) to sell unregistered puppies via the web. None of our dogs are from her kennel (we didn’t even know the woman). When confronted, she justified using the photographs because she **ONLY** used them to show people the different colors available in the breed and what the dogs look like, not to actually “sell” a specific puppy, completely ignoring the fact that she had no right to copy and use them without permission in the first place. It got rather ugly as I would not give permission for her to use the photos since our dogs were bred by a reputable breeder who had followed breed club guidelines and had her dogs health tested before breeding and selling the pups. We had to pay for a legal opinion and to have our attorney send her a letter and threaten a suit to get her to take them down. I worry that Google’s image search feature is a double edged sword that invites people to search and copy at will. We’ve had both photos and text lifted from our blogs several times. My guess is the few instances we’ve discovered are but a tip of the iceberg but I don’t have the time to sit and search Google for each photo that I’ve ever posted – it’s frustrating. Some of the instances I’ve discovered (and mostly by accident) include a garden that used several photos and large blocks of text copied verbatim for an article in their quarterly newsletter, a garden blogger who used photos of our garden on her garden blog and represented them as being of her own garden (including one photograph of my husband planting bulbs with one of our dogs also in the photo), and another blogger who posted my recipe for organic garden spray as her own – copied in it’s entirety, typos and all. Most recently, a writer for an e-zine used two of my watermarked photographs for an article she wrote (and was paid for) on the same topic as one of my blog posts. In the mother of all coincidences, I was at an emergency veterinary hospital over Christmas with the dog in the photograph when another pet parent who was waiting while her pet was being evaluated read some articles that a thoughtful employee had posted on a bulletin board in the waiting area and casually remarked, “Wow, this dog looks just like yours!” and brought the article over for me to look at. Sure enough, there were photos of Katie AND our grape arbor with the watermarks cropped from them. I am intrigued by Lorraine’s method of adding a transparent overlay because I also don’t see much value to watermarks unless they obscure the image in some way, and that defeats the purpose of a gardening blog. A couple of years ago, I started adding them to some of my photos but founds it tedious and time consuming and not much of a deterrent. I don’t earn any money from our blogs or from my photos (we are avid hobby gardeners, that’s all). On the flip side, I purchase vintage images, photos, and ephemera regularly for use in my paper art business and so I find it doubly annoying that some people feel that they have the right to take my work and pass it off as their own, especially if they profit by it, when I am eminently respectful of other artists’ work and copyrights. Thanks for your sensitive handling of a thorny issue. Raising awareness is important and you’ve done so in a most conciliatory and informative way. If I had been through all that, Cathy, I think I’d be so bitter that I’d give up on blogging altogether. I really believe that the majority of cases of infringement are just because people don’t know any better, but you have had more than your share of the mean, deliberately deceitful ones. A garden blogger actually passed off your garden (and husband and dog, too!) as her own!?!?! The mind reels. I am new to Pinterest, but so far, it appears to be at least harmless, maybe positive. I do get a fair number of click-thoughs from there every day. My only concern at this point is that sometimes the text with the photos is taken right from my post, sometimes it is the images’ alt tags, and sometimes it is the pinners’ own words – and usually, the source is not clear. As I mentioned in another comment, using a transparent overlay or right-click protection doesn’t stop people from stealing images by taking screenshots. If they have that mindset, they’ll find a way. I agree that individually watermarking each photo is a time-consuming task; that’s why I’m so grateful that Windows Live Writer does it for me automatically each time I add a photo to a post. If more people knew that they were setting themselves up for fines of $2,500 to $25,000 plus legal expenses for removing or obscuring watermarks (per this article), maybe they’d think twice. I was reminded of you and your blog today when I was sorting through my seeds to see what to start next and came across the seeds you sent me. This is an interesting discussion. I just started a tumblr and have been sharing photographs from neat plants/wildlife/cats in the garden. I enjoy being ‘reblogged’ because its nice to have an audience and know people are enjoying what i’m creating. Plus it automatically links to my page when people use that function of tumblr. But people just copying photos without any attribution is really terrible. Its also just lazy to try and pass off other people’s work as one’s own. Its not hard to grab a camera and start shooting ! Might not be as nice as something professionaly done but that’s how you learn and get better. If this continues to happen to you perhaps you’ll have to look at creating a tab on your main page that says “Photo Policy”. I do have a notice in the sidebar, but thanks, adding a permanent page with a link to this post is a great idea. Tumblr is the same as Pinterest, I think, in that it keeps the original link if people follow the rules but not if they get it from a site that’s used it without permission, or if they save it and then upload it to their own account. And you’re right: digital cameras and camera phones are so prevalent now that anyone could take their own pictures instead of stealing them! I agree that most people who use photos without permission are simply unaware that it’s inappropriate, but it does take a certain amount of chutzpah to use a photo with someone’s husband in it, even if it’s cropped. His face was still quite recognizable, and the dog was front and center! We eventually got what we felt were sincere apologies, appropriate credit for the garden spray recipe, and even a gift certificate to a nursery in our area from the garden club that used my work in their newsletter. The club president was horrified that the woman who wrote the newsletter had “borrowed” virtually the entire newsletter from various blogs. She apparently thought that if it was on the web, it was fair game and she was free to use it. It definitely impacted my blogging last summer. You can tell exactly when this all started in mid June…. my posts ceased. At first, I continued to write but as one issue after another came to light, I became quite reticent to post what I wrote. It sapped my enthusiasm for blogging and eventually I stopped writing completely. .
Hopefully, as spring begins to bloom around me, I’ll find renewed interest in blogging again. In an effort to ease back into writing, in January I re-posted an old post from my art blog (appropriately cited) on the garden blog — I don’t think it’s any coincidence that it’s a post about Katie (the dog in the e-zine pix). Anyone who opts to pursue a legal remedy should be prepared for a slow, tedious process and not necessarily a gratifying one. It’s emotionally draining to catch someone dead to rights using your work and then have them insist that your work is their work. Also, you have to pay your lawyer up front and then fight to get reimbursed. When I was struggling so much last summer, I confided to a paper art acquaintance who owns an on-line art supply store (it affected my art as well as my writing) and she told me that she has been battling other on-line stores for years over the same kind of thing (stealing her photos of art supplies for both print and on-line catalogs), so we gardeners are not alone! I too hope that the new growing season will bring you new strength to again share your garden online, Cathy. It would be a shame to let the horrible people win. The folks who don’t care who uses their posts and pictures have the right idea, I suppose – if it doesn’t matter to you, then you don’t get hurt by it – but it’s kind of hard to be passionate about something and yet not care about how others use your work. I still wonder why people don’t recognize that creating beautiful pictures IS work: not just the skill in composition and the time put into editing and archiving, but also all the time, labor, and money put into designing, planting, and maintaining the plants so there is something to photograph. As I’ve been getting my garden ready for spring, I’ve been moving a lot of plants and ornaments, and even some structures, in an attempt to create different scenes and combinations for this year’s pictures. If I weren’t blogging, I’d probably just stick with what I know I like and will work, instead of taking chances on so many new things. I will mention one other thing (not for you, necessarily, but for others who might not be aware): if a site owner ignores a request to remove one of your photos, you can contact their ISP with a takedown notice and get them to remove the image, as explained in this article. The site owner can then counter the action and get the image restored until you take legal action, but maybe some of them, at least, would decide it wasn’t worth the trouble. Nan, I hope I can be less thin-skinned LOL. We sought legal assistance twice, the first being with the unethical breeder, the second with the e-zine (that is still on-going). Both cases were so egregious, we felt we had no option. We made a lot of changes last summer that I hope I have the energy to share — I can hardly wait to see what you have been up to. Spring is just not coming quickly enough for me. i will say, sharing what we experienced has been somewhat cathartic and I do feel better for it. Thanks for giving an important issue some prime time recognition! Good luck to you, Cathy. I feel bad that I’ve brought up all of this for you, when I’m sure you’d rather have not thought about it again. But if sharing your experiences has helped a bit, then maybe it was a good thing. And, maybe it will help in the cause to make more people aware of the serious issues behind the fun of blogging! No WAY – they entered a contest with YOUR image? That’s just…I can’t even…what is the world coming to? Oh, Scott, you must have felt just sick seeing that. I hope you set them straight! So glad to find your blog! Your photography is fabulous and this article was very helpful. I have recently been dealing with these same issues myself. I am a relatively new blogger with a small following. I thought I was so far under the radar that I had nothing to worry about. I have not been watermarking my photos. Big mistake! I plan to correct this as quickly as I possibly can. I’ve been experimenting with adding text to existing blog photos in Picasa and saving/replacing the photo. The text seems to show up on my blog, but not on Pinterest even when there are link backs. There may be nothing I can do about already published content except possibly remove it and re-publish. I don’t know. Any thoughts? Hi there, Ally! I took a look at your blog and didn’t see any watermarks on your photos; maybe I just missed the posts where you’ve already replaced the photos. I could be wrong, but I think once an image gets pinned, it appears as it did at the time it was pinned, so replacing the photos now won’t change existing pins. It will help if someone pins them from now on, though. I hope that makes sense! This is Tracie Bergeson of Bergeson Nursery in Fertile, MN. We are making signs for our perennials. One sign we will make is for the Black Adder Dianthus. As I peruse the internet for a photo, I found your beautiful image. I’m wondering if/how we can get permission for the use of that photo. I’ve bookmarked your site to enjoy and explore (after hours); your photos are great. Thanks for getting in touch, Tracie. I’ll respond to you via email. Nancy, your gardens and photo’s are lovely! I chuckle at the message from Bergeson’s I happen to live not far from them and can vouch they are a reputable company! I have purchased many plants from them. And now will have to check out the Black Adder Dianthus. I enjoy your blog greatly. Thank you for allowing me to peek! Thank *you* for reading, Jenny. Have fun plant shopping this year!